The driven element of the Yagi-Uda antenna requires a balanced line at the input/output terminals, as required by the open dipole radiator. A balun with impedance transformer is required to avoid minimum reflection losses arising from mismatch of impedance. This includes the 180° phase shifter. 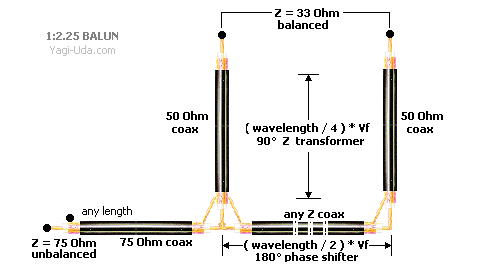 A cheap method to feed the 28-Ohm, the 33-Ohm or the 50-Ohm intrinsic impedance Yagi-Uda antenna to unbalanced coaxial line has made by the adaptive coaxial balun, known as 1:1 balun only, since the early year of radio astronomy. The 1:1 balun, the 1:2.25 balun and the 1:1.77 balun is easy to build by standard coaxial cables in the frequency range from HF up to VHF and lower part of UHF. 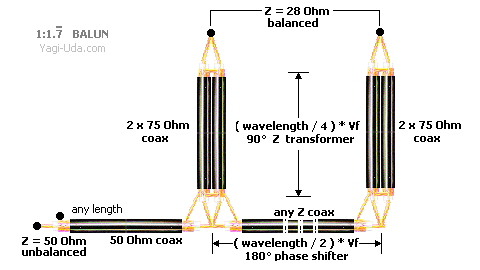 For higher frequency or different ratio a 90° pair transformer by coaxial or strip line hardware has required. The balun where 50-Ohm coaxial unbalanced line matches to balanced 50-Ohm antenna. A balun where 75-Ohm coaxial unbalanced line matches to balanced 33-Ohm antenna. A balun where 50-Ohm coaxial unbalanced line to match balanced 28-Ohm antennas. Copyright © 2008 Yagi-Uda.com, All Rights Reserved.